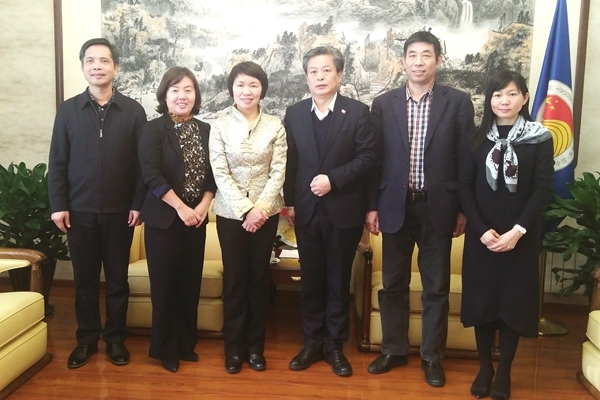 On 24 January 2019, Secretary-General of ASEAN-China Centre Mr. Chen Dehai met with Ms. Lin Na, Party Secretary of Guilin Tourism University (GTU), Mr. Cheng Daopin, President of GTU and the delegation. The two sides had in-depth exchange of views on strengthening people-to-people exchanges and cooperation in tourism education between ASEAN and China. Ms. Kong Roatlomang, Director of Education, Culture and Tourism Division (ECTD) and Ms. Zhou Hui, Deputy Director of ECTD of ACC attended the meeting.